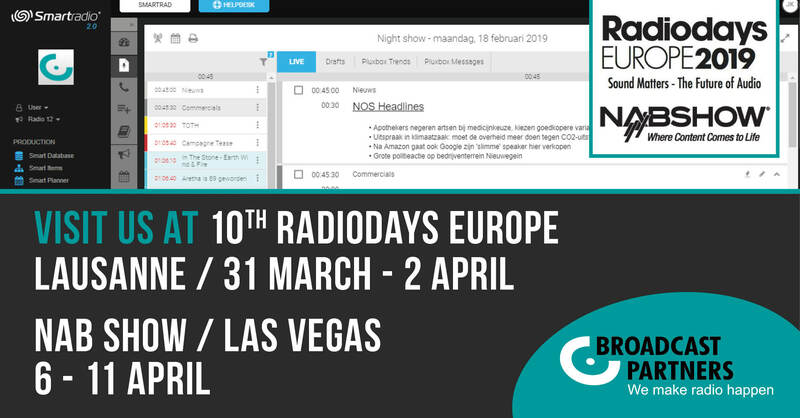 SmartRadio® will be attending Radiodays 2019 in Lausanne, Switzerland and NAB 2019 in Las Vegas in the U.S. At these 2 major events, we look forward to demonstrating our latest developments to you. SmartRadio is a cloud- and web based radio-as-a-service platform and consists of different components and can be easily customized as of preferred requirements. Cloud multichannel production possibilities for live- and on demand purposes are available in a very user-friendly web interface. At Radiodays and NAB SmartRadio will launch their newest web based Smart Player. In SmartRadio, an integrated solution for radio stations is available by using Radiomanager. Use the rundown to schedule your content, or easily deliver your information to multiple online- and social platforms. Easy to customize as of wishes of end-users. The latest feature and add-on to SmartRadio is the 100% integration of Music Master Scheduling Software® into the platform, radio-as-a-service. Simply schedule your channel in Music Master Scheduling® and define all your unique parameters. SmartRadio playout and processing will take care of the complete solution to deliver live! The aXemble headend is a well-known solution that has been used in various countries around the world for some time now. Recently we have added the aXemble Cloud to our portfolio in order to offer the same functionality as the hardware version in a cloud based service. For an attractive monthly fee, you can access your station’s information through the web interface. aXemble cloud provides “as-a-service” solutions for DAB+ transmissions.